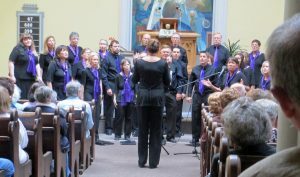 Although our concerts provide some income, we must still charge our members dues and fees of $150 per year to meet our ongoing expenses. Additional funds would allow us to buy sound equipment, a trailer for our risers, and other equipment. We are a non-profit 501(c)(3) organization and your donations are tax-deductible. Donations are acknowledged in our printed May and December concert programs.